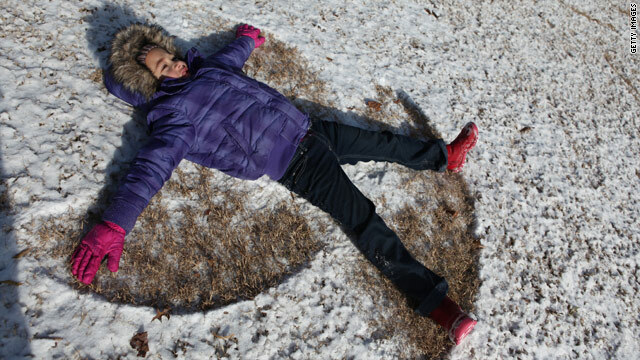 Ariana Ingle, 6, makes a snow angel Friday in Atlanta, Georgia. Many schoolchildren in the South got a snow day Friday. (CNN) -- The South emerged Saturday from another night of bone-rattling cold that has seen records fall and homeless shelters fill to capacity. Alexandria, Louisiana, reached a record low of 16 degrees overnight, and Beaumont, Texas, set a record at 19 degrees. Waco, Texas, dipped to 8 degrees. "That's the first time they've reached the single digits in Waco in more than 20 years," CNN meteorologist Bonnie Schneider said. By comparison, it was 28 degrees at noon Saturday at the McMurdo research station in Antarctica. With an actual temperature of 14 degrees Saturday morning, Schneider said, the wind made it feel like zero in Atlanta, Georgia, where ice-covered roads caused hundreds of traffic accidents and officials closed the zoo to protect animals and patrons alike. "The north Georgia mountains are even colder, with temperatures down to 3 degrees, not the wind chill, but the actual temperature," said Brad Nitz, a meteorologist at CNN affiliate WSB-TV in Atlanta. Nine deaths nationwide have been attributed to the recent winter weather. More than 200 manatees huddled in the warm water outside a power plant near chilly Jacksonville, Florida, CNN affiliate WJXT reported. Wet, 36-degree conditions didn't stop thousands of runners from participating in the Walt Disney World Half-Marathon Saturday in Orlando. "Oh, it was cold out there. It's been raining all morning since we got here about 4 o'clock. It's been very, very cold," a North Carolina runner named David told CNN affiliate WESH. "I was expecting a little sunshine here in the Sunshine State." Florida produce growers continue to struggle to save their crops as overnight freeze warnings were issued in central Florida, WESH reported. Temperatures are expected to fall to 20 degrees or lower Saturday night from Tampa to Jacksonville, the National Weather Service predicted. Farther west, the severe cold snap has meant big business for at least one propane gas supplier in Alabama. "This has been the worst winter I've seen," Bill Myers of ACME Propane Gas in Montgomery told CNN affiliate WSFA. "I've never had this many calls on a day-to-day basis." Myers told the station his company is getting as many as 400 calls a day. "You gotta have heat. As cold as it is, you can't expect them to just stay at home and be cold," he said. With wind chills dipping to 10 degrees, the city of Little Rock, Arkansas, worked with local nonprofits to open a new homeless shelter at the Nathaniel Hill Recreation Center. It filled to capacity within 24 hours, CNN affiliate KATV reported. "It means I've actually got a warm place to sleep, a roof over my head and at least I'm comfortable and have food in my stomach," a homeless man, Jerry Anders, told KATV. Cold winters are not unusual in the Great Plains and upper Midwest, but even there people notice when the temperature hits 31 below zero, as it did overnight in Aberdeen, South Dakota. It was minus-21 in Valentine, Nebraska, and minus-15 in Grand Island, Nebraska. The cold hampered firefighters who were not able to save a bowling alley that burned down Friday in Omaha, Nebraska, CNN affiliate KETV reported. "You can't do your job as well," Omaha fire Capt. Pat O'Brien told KETV. "You get cold and tired more, the added weight with ice and snow with your pack and equipment. ... Your gloves get frozen. Your hands will be curled in one position and you can't move them." But all bad things must come to an end. "Relief is coming in terms of warmer air," CNN's Schneider said. "It's frigid right now, but here's some relief: Monday and Tuesday -- less cold. Warm air will start sliding to the east, and we'll have some changes for the better."